Do you grow these for bird food? Or for decoration? Or both? Sunflowers make a great garden "screen" if you can grow enough of them together. The palette here is gorgeous, with silver/gray, brown, and black. 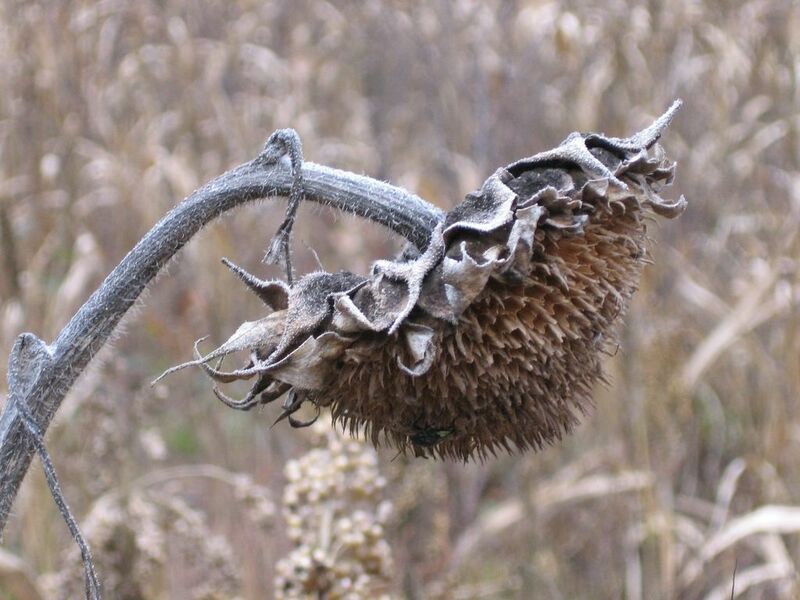 It won't be long before the little birds come looking for sunflower seeds. Beautiful pic, FG. Wow! That's an awesome photo. Great Job! I used to love to see the giant sunflowers Amish women grow in their yards. They usually had netting on them to catch all the seeds. Pretty picture but a bit sad, too. Summer seems so far away now. Winter has its own beauty, doesn't it? Other than Tulips, Sunflowers are my favorite flower. I tried growing them this year but they didn't even sprout, so I will try again next spring. Hopefully, I will have some pictures for you next year! Thanks for sharing. Looks like she's hanging her head, sad that summer is over and the days are short now. aw... i just quit my job at a flower shop, where we sold many sunflowers... as often, your pictures play two rolls for me -- (a) allow me a glipse into your wonderful world, and (b) speak to my own, albeit vastly different, life in the city! Really beautiful, in a totally different way. Thank you! Would you just look at that photo! How good is that! Can you imagine what could be done with lead pencils with that textured grey stalk area, and the soft background?Then,a little bit of sepia for the flower... You are so clever and intuitive!